Seeing the unusually shaped orange object in the kitchen, the Corgi pup, named Bilbo, goes on the defensive as he stares curiously before letting out an almighty bark at the October icon. Then, deciding to take matters into his own paws, the feisty fur ball prepares to mount an attack. As he squares up to the pumpkin, he cautiously approaches one side of the fruit before reaching out his furry foot to subdue the inanimate object. Clearly, having no effect, the cuddly Corgi dashes around to the other side of the miniature pumpkin to prepare for another unannounced attack. Summoning as much bark as he can possibly muster, the perturbed puppy has another go at trying to get a reaction from the strange-looking pumpkin. All the while, his owner continues to film without making so much as a sound, in order to allow the fruity fumble to continue. 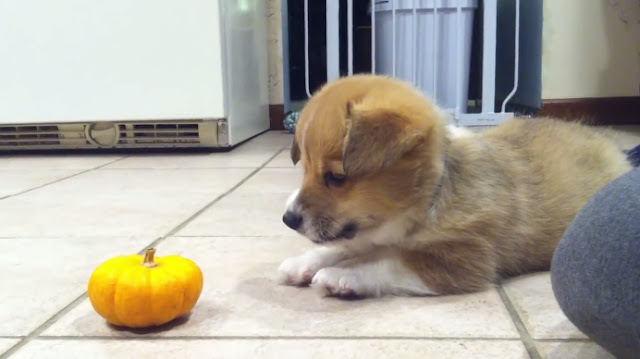 Responses to "Fall In Love With This Corgi Pup Trying To Spook A Mini Pumpkin"